Among the most memorable moments in the history of animation, the ‘Silly Song’ sequence is a musical celebration honoring the Dwarfs new house guest. 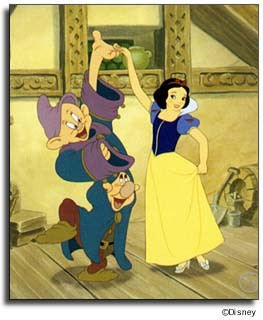 Dopey gets on Sneezy’s shoulders to create an appropriate dance partner for the princess Snow White. This limited edition sericel recreates Sequence 8A, Scene 33A of the classic 1937 animated feature. A total of 25 separately screened colors were required to recreate the colors of the original film.